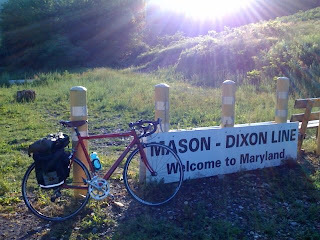 documenting my trip on a bicycle from Pittsburgh to DC with a detour to Lost River, WV to stay at a modern prefab house for a few days. Right outside the U-Street metro stop, about a block from Gigs' place were these guys giving away lemonade. They told me that they tried to sell it but no one was buying it. I'll have to get them talking to the kids with the lemonade stand along the trail. It was nice getting another cup of lemonade and fun to see these guys having a good time giving away lemonade in the middle of the city. Everytime I visit Gigs in DC, he makes sure that I don't get to sleep before 4am. The last time I was here I had 3 hours of sleep but he made sure that I was going out that night. This time, after riding several hundred miles he wouldn't allow me to have any rest. Heading over to Chinatown with some friends, we were out and about until the wee hours of the morning. Fortunately, he has to work during the week so he lets me go to sleep a little bit earlier on the weekdays. This was looking ahead at the final large moutain I'd have to climb on my trip. Part of the Blueridge Mountains, the Appalachian trail passes along the summit. To be quite honest, I didn't want to do this anymore. I was sick of riding on Route 7, the only way over the hill. The shoulder was terrible and the motorists weren't too friendly. I'd find another way if I could do it again. I ended up walking up most of the mountain because the gravel shoulder was terrible for riding and my legs were worn out. I was just looking forward to getting to Purcellville, where the W&OD rail trail started that would take me the rest of the way to Falls Church, VA where I'd be catching the metro. What a great start to riding on the trail! Less than half a mile into a trail I ran into this lemonade stand. These kids are brilliant, they're probably making a killing. Organic lemonade no doubt! This kids are sophisticated. I bought a cup of lemonade and cup of granola for 75 cents. Best deal in town. 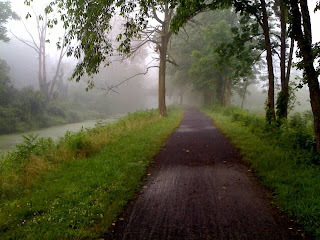 Now I was on the nice bike trail, it was nice not having to deal with cars. 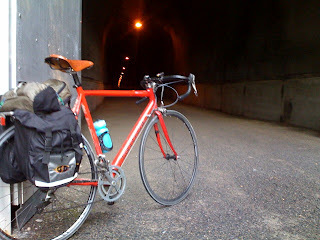 There were so many road bicyclists on the trail, it was culture shock for me. When coming back from another country it usually takes a few days to adjust, same with bike riding in the middle of nowhere. 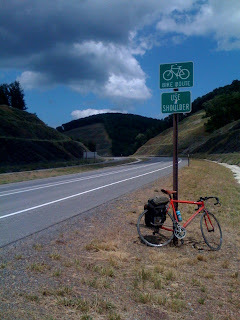 After several days and several hundred miles, I hadn't seen a single bicycle. Now all of a sudden I was surrounded by bicyclists. It was nice to see other people, but I had come to expect not seeing anyone most of the trip. I met Teresa, in the middle, at a rest stop along the trail. She was along with her bike club on a Saturday ride on the trail. They were headed to lunch about 10 miles away and encouraged me to come along. Riding with them pushed me to keep going, we were doing between 15 and 20, much faster than the meandering pace of 11mph that I was going before. After 60 miles of riding and all my gear, I really didn't want to go very fast. I was glad that I had to though, otherwise it would have had the energy to keep going on. We stopped at a brewpub tucked away in an office complex off of the trail. I still had 20 more miles to go, it was good to get a nice meal for the final stretch. Ugh! The final stretch was wearing on me. It was along power lines and there was no shade. Today was definitely the hottest day of the trip and I was getting tired of being baked as I rode along. My ankles only hurt more and more, I just wanted to be done. 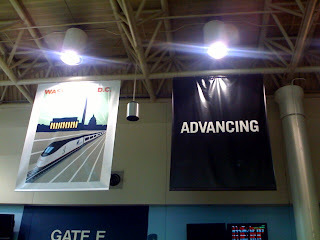 Finally, after a boring and hot final leg, I made it to the Falls Church Metro! It was wild seeing it, I couldn't believe I actually did it. Did I really just ride this far? Am I sure I just didn't get dropped off here via a car? Was this all a dream? The throbbing pain of my ankles assured me that yes, I really did just do this. Winchester is a great little town, with a beautiful pedestrian center and some nice parks on the outskirts. 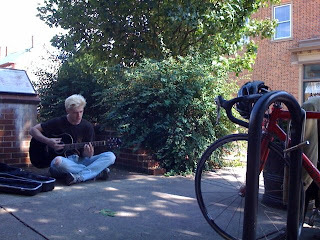 Daniel was the one I mentioned before who was playing music on the street. I didn't have a place to stay in Winchester, so he let me crash on his couch. He even made me a pizza for dinner! Being a computer guy, we had a good time chatting about different Linux distributions and other computer geekish stuff. Under 100 miles to DC! Anyone know what these things are? I saw plenty of them growing alongside the road. 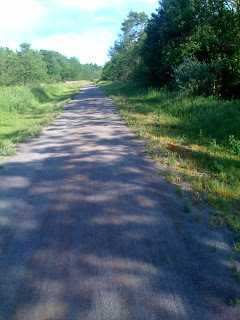 Miles upon miles of pavement... after the gravel road, I was still happy to see anything remotely paved. 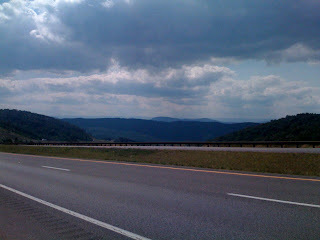 The mountains gave way to flat land and it was smooth sailing for 20 miles into Winchester. This picture was taken looking behind me. Storm clouds were coming and produced some strong winds. Fortunately, they were going in the direction that I was going in and I was able to sustain riding at 25mph for a good amount of time. About 10 miles outside of Winchester I started seeing McMansions. I think that was the first time I was glad to see suburban sprawl, as I knew I was getting closer to DC. However, after about 10 strip malls and 30 developments, I was over the 'burbs once again. Crush your smokes, it's day 6! After 2 days of resting in Lost River, it was time to finish get to DC. 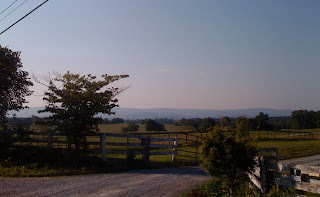 Day 6 would be from Lost River to Winchester, VA. This would be my shortest ride, at 60 miles. However, it wouldn't be without its complications. Each time something goes wrong on my trip, it tends to happen within the first 25 miles. Day 6 was no exception. 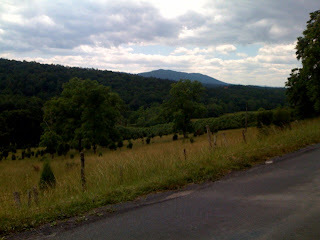 I was taking some backroads to get to Route 55 that would take me into Virginia. 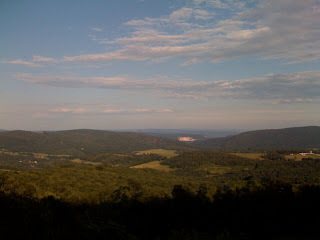 It was a nice ride, I actually ended up in George Washington National Forest for most of the ride. 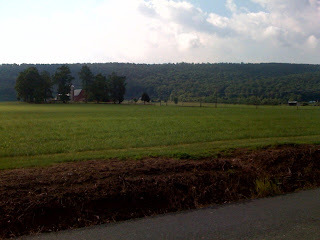 Partway through the ride, I see a sign that tells me to take a left to get to Wardensdale, a town I needed to get to. There were no street signs, so I had no way to know it was the road I wanted, but I figured it had to be right. As soon as I got on it it turned into a gravel road. Oh and it was up on another hill too. This is West Virginia after all, I've just come to expect it. It wasn't a good feeling. I knew that it wasn't a question of if, but when I would get a flat tire. Every piece of rock looked like it was waiting to stab into my tire. I intently focused my concentration on the thousands of rocks, endlessly scanning for anything that looked remotely pointy. About 4 miles into it, I heard it. That terrible hissing sound was coming from my back tire. Sure enough, no matter how much I didn't want one, it still happened. I sighed, got off my bike and quickly got to changing it. Thanks to the several trials the other day with bicycle tubes, I was able to replace it in only a matter of minutes. However, this was my last spare tube I was carrying with me and the patch kit wouldn't hold the pressure of my tires. Now more than every I felt the weight of every rock, worried that if I got a flat my ride could potentially be over. What would I do? I'd have to find a park ranger and somehow find a way to the nearest bike shop... in Winchester 40 miles away. Would I hitchike? Would people pick me up? 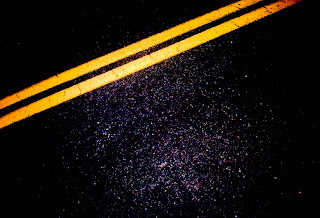 All these thoughts haunted me till I made it till the end of the gravel road, about 45 minutes later. 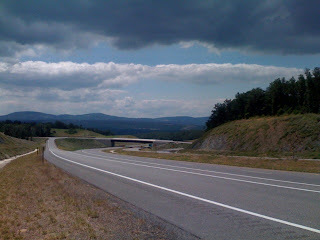 It was such a joy seeing a paved road again and I was soon on 55 making a break for the VA border. Only I needed to climb another mountain to get to the border. Chris and Sarah's Cabin is beautiful. The cabin was one of the reasons I decided to plan this trip (along with my love for bicycles and DC). It was wonderful being able to have a silent retreat for a few days. I didn't even see anyone for two whole days! 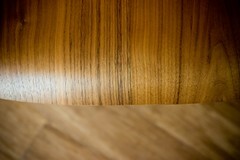 I posted pictures from the cabin in a flickr photoset, check them out here. I'm here at Big Bear Cafe hanging out for the afternoon. 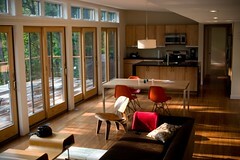 It's nice during the summertime with all the big windows open and fans running. I got a wonderful shot of espresso that was well prepared, one of the reasons that I often come here. I'm now here in DC, just wanted to give everyone a quick heads up. It was toasty out today and it definitely felt like a long ride. Each day of riding compounds on the other days. I'm heading out with Gigs now (my host and former fraternity brother). I stayed with him in March and had such a great time that I decided I needed to come back again. I'll be updating the blog tomorrow, there is so much to post about! From standing on tops of mountains, (more) flat tires, prefab architecture living, to meeting so many great people along the way, I look forward to telling you all the stories. No showers, slugging through mud, fixing greasy chains, sitting in the dirt, and riding 200+ miles for 3 days didn't make me smell or look very good. I finally made it to Lost River, after a tough 80 mile ride. I had ridden through swamp waters, climbed mountains and descended into valleys. Now was the last task, to make it up the driveway. 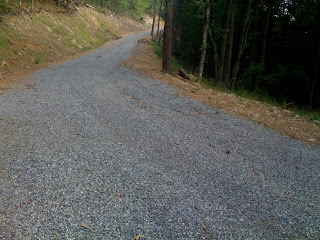 This isn't any ordinary driveway, it goes up the side of a hill and is all gravel. I contemplated sleeping at the bottom of the driveway, but figured that probably wasn't the best use renting the cabin. I was here but it felt so far. Digging my feet into the gravel, I slowly pushed my loaded down bike up the hill. It probably took me a good 15 minutes to make it up there, but it felt so good once I made it. I was now home for the next two days. Time to start heading up! 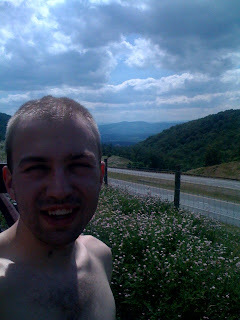 This is a photo of me getting onto Route 55, a new highway in West Virginia. The climb was long and grueling but I loved the bike lane, which was about 6 feet away from the road. Route 55 was a quiet road that very few people were on. 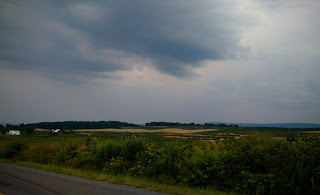 This was one of my favorite roads to be on, as it lead to spectacular views and I feel in love with the bicycle path. I think I'm going to write to the engineers or someone to thank them. This was the view looking back towards Moorefield, the county seat. The town is down in the valley a few miles away. I need a flash on this camera. It was really bright out that day, but still not very hot, only in the 70's. Unfortunately my back got burnt along the way, the price to pay for looking cool and not wearing a shirt. This was near the top of the mountain I climbed. A lady slowed down with a bike rack on her roof and gave me a thumbs up and smiled. I found several nice outdoorsy people along the way that were happy to see me out on the road. It makes all the difference when it feels like the motorists are with you rather than conspiring to run you off the road. To give you an idea of how high this mountain was, Mt. Washington in Pittsburgh is 367ft high. This mountain is 1,200ft. That's like 3 Mt. Washingtons stacked on top of each other! While it wasn't nearly as steep as Mt. Washington, it surely had it beat in height. The hills quickly rise to a peak and drop off, as if their sole purpose is to split the landscape. This doesn't convey the mountains that I skirted between that seemed to force themselves out of the flat land from nothing. 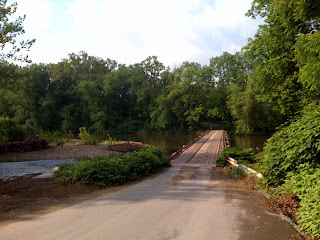 One of the few remaining privately owned toll bridges in the country, this is the only way to cross the river in the area. Apparently it sometimes shuts down when the water level is too high, and after the storm from the night before I worried that this could be the case. If it was closed, I had no idea what I'd do. The next bridge was 15 miles out of the way. Fortunately it was open and the toll bridge lady didn't even charge me. I saved 50 cents, which would soon go towards the price of an ankle wrap for my throbbing, busted leg. The C&O canal was nice... for about 10 feet. Shortly after that it turned into a soup of water, dirt, and rocks. My little 20 centimeter road bike tires weren't happy with this and neither was I. The 19 miles I was riding on the trail took twice as long as I had hoped. 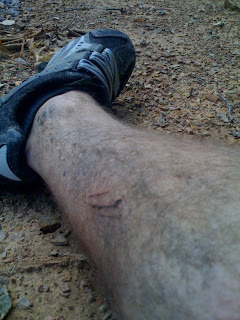 The trail bruised and battered my ego, how was I going to get to the cabin 80 miles away if I can't get done with the first 19 miles? 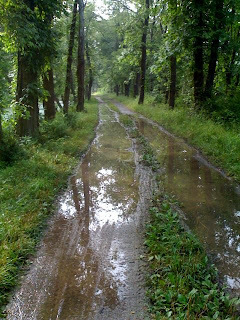 It felt like it would never end, as I was caked with layer upon layer of mud trying to dodge the worst mudholes. Several hours later, I made it to the bridge in Oldtown, MD to cross into WV. I was excited, but by this point my ankle was burning and aching to an almost unbearable level. I knew that the only way to fix my ankle was rest, which would be 60 miles and 6 hours away from where I now was. Once you hit the Eastern Coninental Divide, there are several important things within a few miles. You've got Big Savage and the Mason-Dixon Line. Also, it's all downhill until Cumberland. I took this picture around 7PM and had about 20 miles left to my 100 mile day. I was tired but had to get to Cumberland before sunset, as there's no lights on the trail. With about 10 miles left, my bungie unhooked and Proceeded to wrap around my rear cassette and hit several spokes... while I'm chugging along at 20mph. 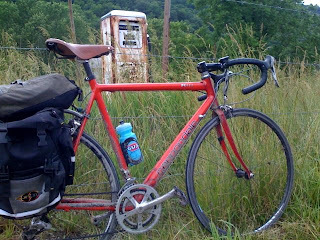 I was worried that my spokes would be bent beyond repair, my derailler would be stuck in one gear, or not work at all. Fortunately, it all worked fine, except for one of the middle cogs skips, which isn't a big deal. So I make it into Cumberland and I need to find the house I'm staying at fast, it's getting dark, windy, and I see lightning off in the distance. This isn't good. I know the house is up on a steep hill, the last thing I want to do after 100 miles. By this point it starts POURING and I can't find any street signs. As I'm pushing my bike up a steep hill, the directions to the house come out of my hand. With all the wind, it is soon completly gone. I'm just left guessing and using my phone when I can. After 30 minutes in nasty rain that I didn't want to deal with, I finally find the house. I was glad to see it but frustrated it took so long. 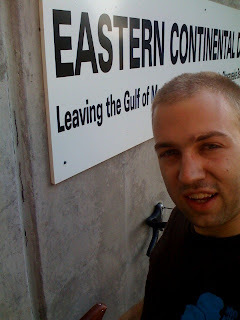 As I had an 80 mile ride coming up the next day, I quickly fell asleep so I could be on the road riding by 6AM. I just met Daniel, playing guitar on the street. He's playing a blues riff while I update the blog. Winchester is a smallish town, with a wonderful pedestrian center. Big Savage Mountain was named after a group of surveyors, who in 1736 got stranded and were quickly running out of supplies. John Savage, one of the surveyors, offered himself up (or was forced to) as the main dinner course. Fortunately, a rescue team arrived and John got a mountain named after him for his heroic act. 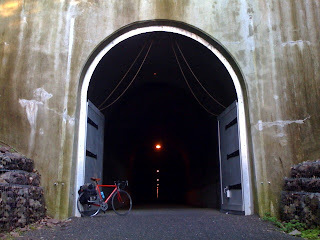 My bicycle at the entrance to an engineering wonder, the Big Savage Tunnel, 3,294' long. The rest of the ride for the day was downhill. Only about 23 miles left to go! I spit on each side of the divide. So regardless of if you're in the Gulf of Mexico watershed or The Chesepeake Bay watershed, you may have a small amount of my spit in your drinking water. Cool, huh!?! Heading for the great divide!